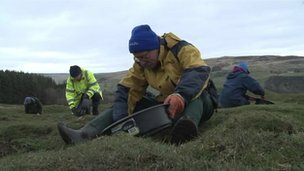 Paul Frodsham, an archaeologist with the North Pennines Area of Outstanding Natural Beauty (AONB), runs a project called Altogether Archaeology, which has signed up 500 volunteers to take part in digs under professional supervision. Fifty of those have taken part in an effort to sift through the molehills at Epiacum and keep a record of what the animals dig up and where. Is it possible to enjoy a more harmonious relationship with moles? "I realise it sounds a bit ridiculous, but it's actually quite serious," Mr Frodsham said. "We look at all the finds and we work out what's going on in different parts off the fort and different kinds of pottery tell us what dates different buildings are." He stressed the work must be done with the permission of English Heritage. As well as fragments of pottery and glass, the moles have dragged up some attractive and intact artefacts. A molehill recently pushed up a piece of Samian ware - a type of brown pottery common on Roman sites - thought to be a stand for a vase or bowl, or possibly an egg cup. Last year they discovered a jet bead and a decorative bronze dolphin. Elaine Edgar, who with her husband owns a farm on the land, is trying to promote the site as a tourist attraction as part of an 18-month project, funded by a £49,000 lottery grant. Mrs Edgar said she had run a series of events as part of the project, which had attracted higher than expected numbers and she had received "fantastic support". But she expressed mixed feelings about the subterranean creatures that were playing their own part. 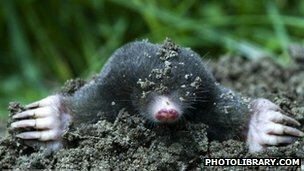 "Moles are the bane of landowners' lives," she said. "They're up there all the time digging away on the land and my husband generally wants to get rid of them." For the time being though, they are serving an important purpose. "I'd like them to uncover as much as they can for the foreseeable future, until we can hopefully do an organised dig somewhere on the fort," Mrs Edgar said. "We're looking towards our bigger vision, which is to establish a fully-fledged visitor centre on the farm." 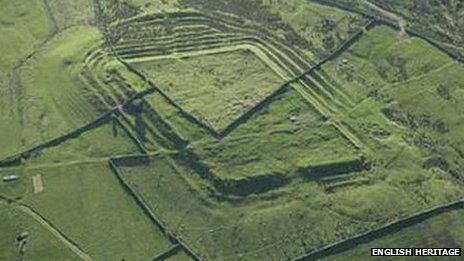 The fort dates back to about the 2nd Century AD, when it is thought the Romans wanted to control lead and silver mining in the north of England. The Romans maintained a military presence there until the 4th Century, when they seem to have abandoned the fort. A recent English Heritage survey also revealed there was an extensive civilian settlement, or vicus, beyond the ramparts. There have only been two recorded digs of Epiacum, in about 1810 and 1957, covering small areas of the 100-sq-m site. Despite such limited excavation, the foundations of the Roman buildings are still visible. There are four rings of earthwork defences, which Mr Frodsham described as "spectacular". "From that point of view, it's one of the best-preserved forts anywhere in the empire," he said. But, it seems, only the moles know the true extent of its treasures. A woman killed in a crash in Cumbria that also left a lorry driver seriously injured is named as Elizabeth Bailey.